New Hyundai i30N offers Pace and Grace. 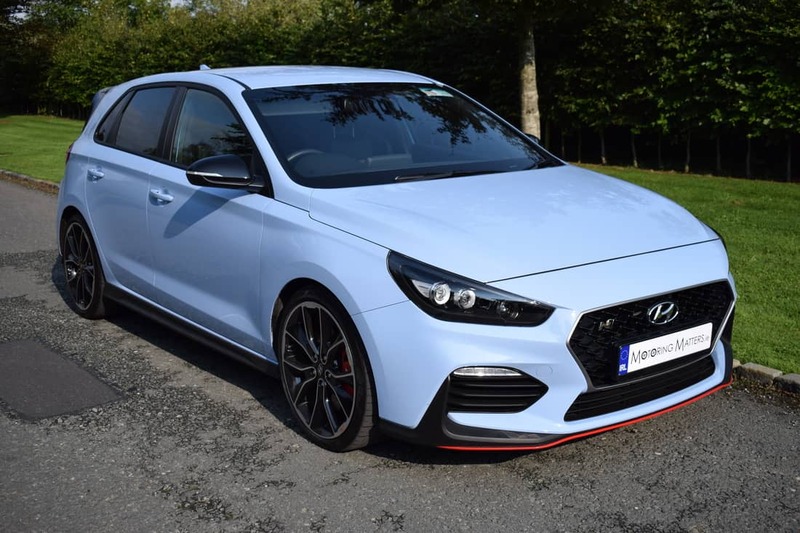 Born on the race track and engineered for pure driving fun, Hyundai’s very first performance road-car – the i30N – really has what it takes to be noticed in the ‘performance car’ car park. Created by Hyundai’s newly-formed ‘N Division’ (where the ‘N’ represents both ‘Namyang’, which is the region in South Korea where the car was developed, and ‘Nürburgring’, which is the legendary German race circuit where its handling was honed), the i30N counts among its rivals the Volkswagen Golf GTI, SEAT Leon CUPRA, Renault Megane R.S., Ford Focus RS and Honda Civic Type R.
Based on the traditional i30 hatchback, Hyundai has adorned the ‘N’ model with sporty and distinctive good looks thanks to an aggressive front bumper with large air intakes, a redesigned rear bumper with an eye-catching diffuser, dual sport-muffler exhausts, triangular high-level brake light, an aerodynamic rear spoiler, advanced LED front & rear lighting with full LED dual-headlamps featuring static bending, and stunning 19” alloy wheels with Pirelli tyres and large red-coloured brake calipers. The i30N’s cascading front grille (with an integrated ‘N’ badge) makes a clear statement of performance, as does the red character-line on the front & rear bumpers. 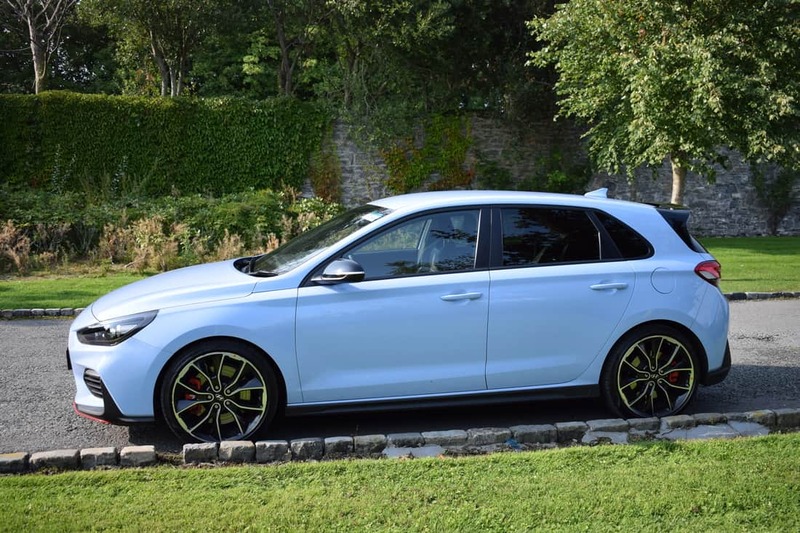 The i30N sits 8mm lower to the ground than the car on which it is based and this provides the car with outstanding driving dynamics as a result. 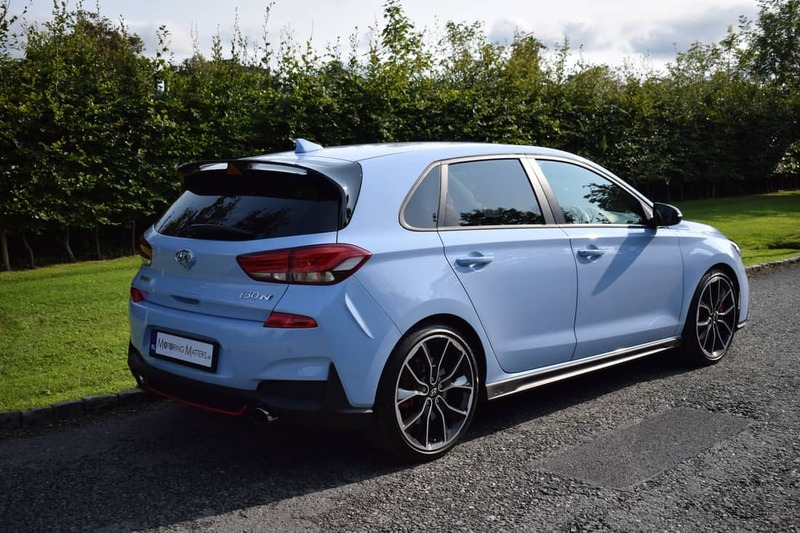 My test car was a Hyundai i30N in standard 5-door guise and was finished in stunning ‘Performance Blue’ paintwork for a truly outstanding look. With this striking colour only available in the ‘N’ model, exclusivity is guaranteed, but a further 5 colours are available too. Standard specification included auto lights and wipers, leather & suede upholstery, electrically adjustable front seats with memory function and cushion extensions, split-folding rear seats, leather-trimmed multifunction steering wheel, Bluetooth with voice recognition, remote central locking, satellite navigation, rear parking sensors and a reversing camera. 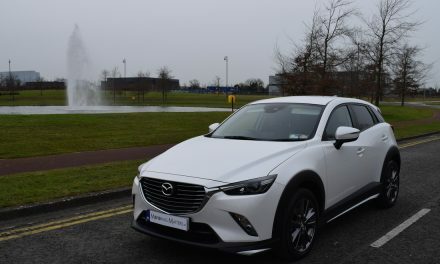 Standard safety and security features include ABS, Autonomous Emergency Braking, cruise control with speed limiter, multiple airbags, electronically controlled suspension, electronic stability control, electronically controlled limited-slip differential, Hill Start Assist, Lane Keep Assist, rear ISOFIX anchorage points, Speed Limit Information Function and a Tyre-Pressure Monitoring System. 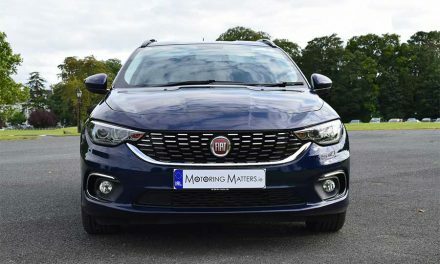 Only available with a 2.0-litre turbo-charged petrol engine (T-GDi) and a six-speed manual gearbox, my test car produced an impressive 275bhp and a healthy 378Nm of torque for super-swift acceleration. The 0-100km/h sprint can be completed in just 6.1-seconds on the way to a limited top speed of 250km/h (where permitted). Power delivery is outstanding, with terrific low down punch available from a standing start. 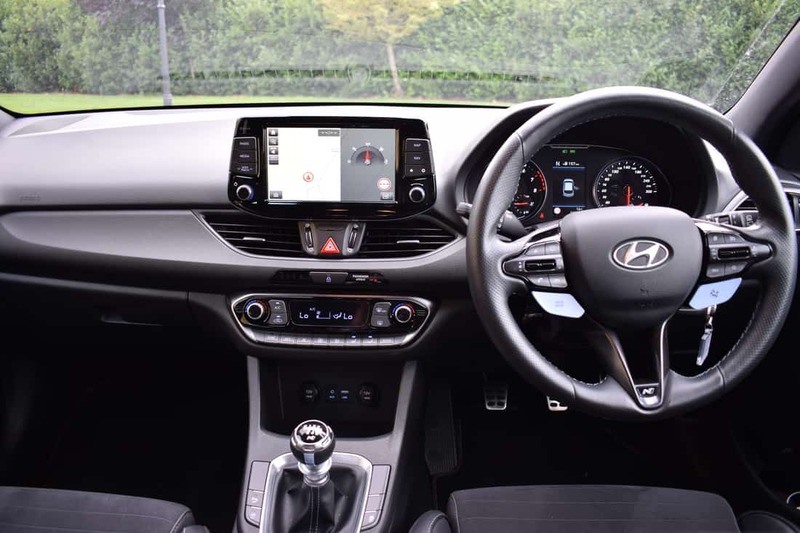 Different driving modes can be selected through the touch screen infotainment system or buttons on the steering wheel, including ‘Normal, ‘Sport’, ECO, ‘N’ and ‘N Custom’. 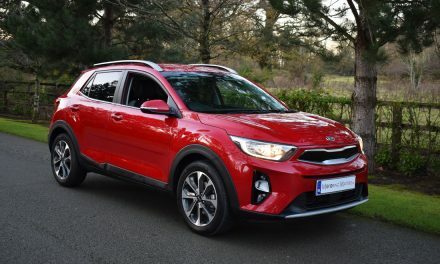 The custom mode is hugely impressive with over 2,000 potential combinations to adjust the chassis set-up, engine settings and exhaust note – among other things. 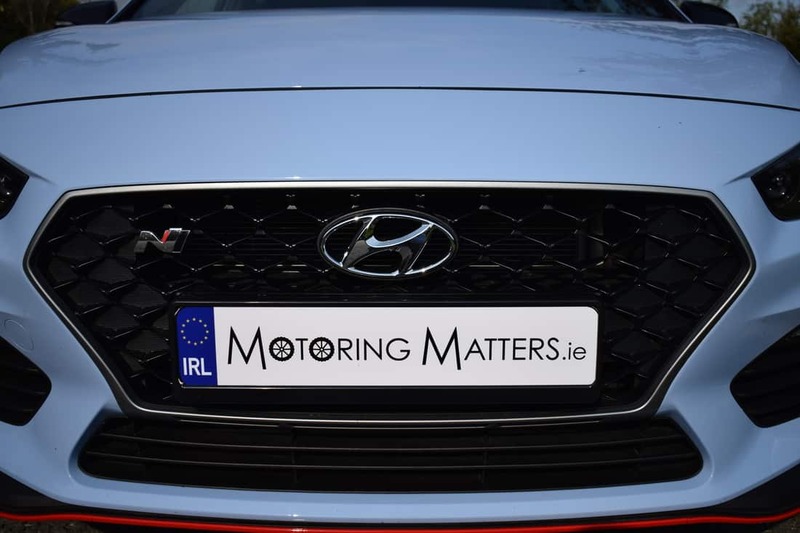 Hyundai officially claim fuel economy of up to 40.4mpg on a combined driving cycle, but the final figure will depend on how the car is driven and what ‘driving mode’ the car is driven in. 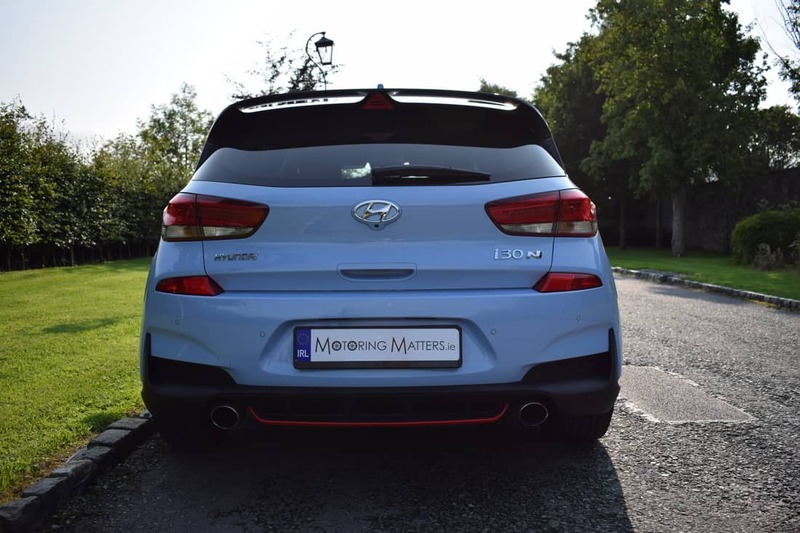 On the road, the i30N never fails to shine and is guaranteed to raise a smile thanks to the exciting sound from the engine and exhaust pipes. The cars steering is precise and offers excellent feedback, body-roll in corners is well controlled and the car performs with terrific refinement. At all times, I found that the car felt well planted on the road and the front end grip from this front-wheel-drive car was confidence-inspiring. 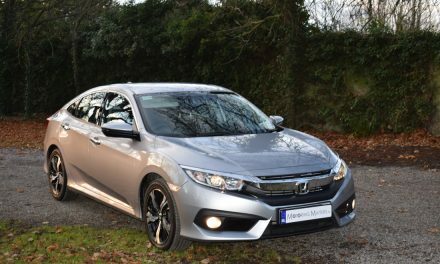 The car’s 6-speed manual gearbox uses a rev-matching function to ‘blip’ the throttle on downshifts and works extremely well when called upon. 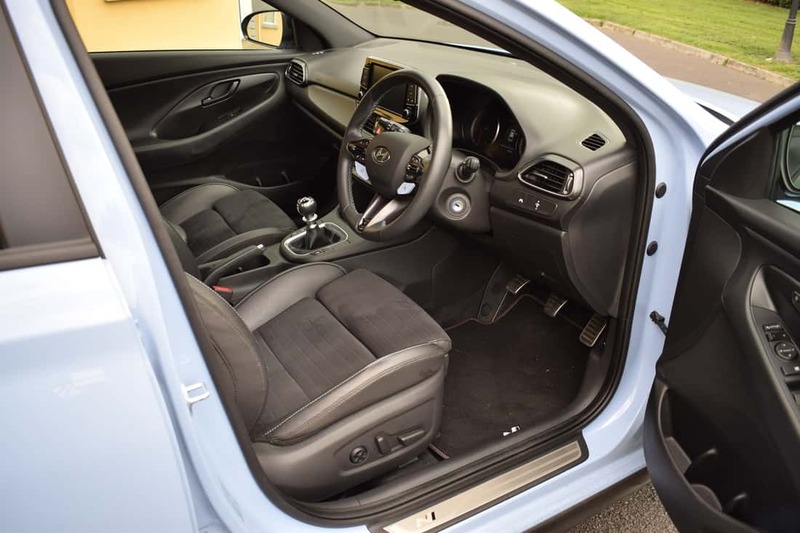 A modern, logically laid-out dashboard design and comfortable seating made the cabin of my test car a very pleasant place to be, while adaptive suspension handled different road surfaces with ease. 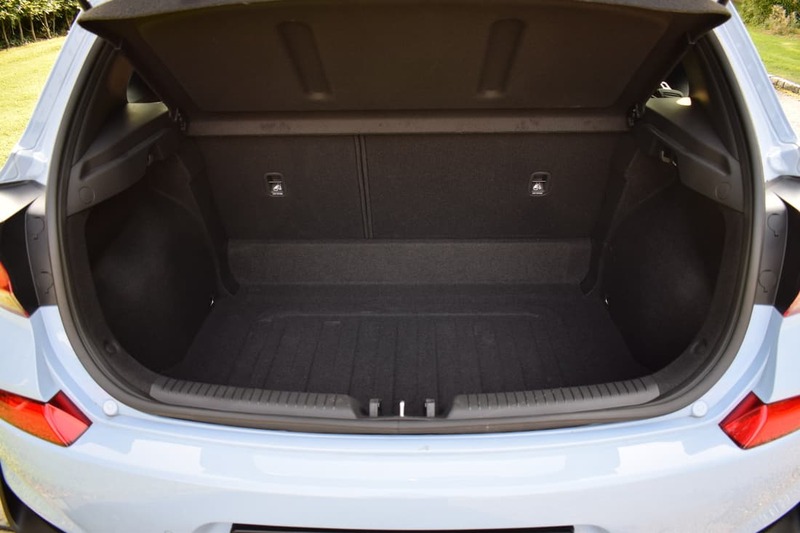 Practicality is another trump car that the i30N can play with confidence, thanks – in no small part – to a 381-litre boot space with the rear seats in place. This can be extended to a substantial 1,287-litres with the rear seats folded flat. 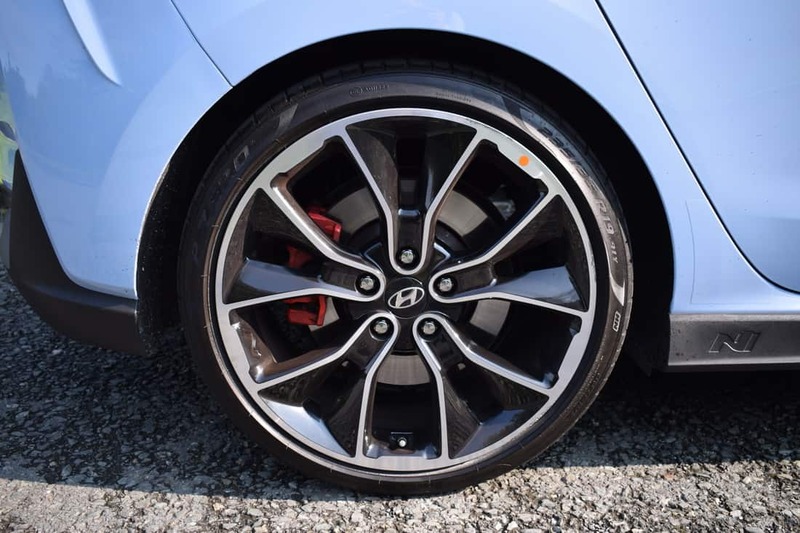 A full 5-star EuroNCAP rating was awarded to the Hyundai i30, while large front and rear brake discs ensure that the car stops with the same urgency as it accelerates. 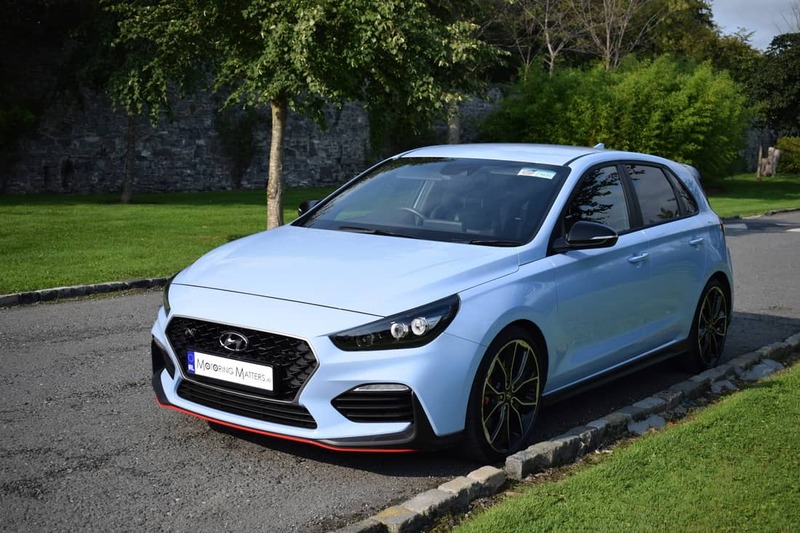 The i30 may be the first car in Hyundai’s stunning passenger-car line-up to receive the ‘N’ treatment, but more models are in the immediate pipeline and, based on my experience with the i30N, the future for Hyundai’s ‘N Division’ looks very promising indeed. 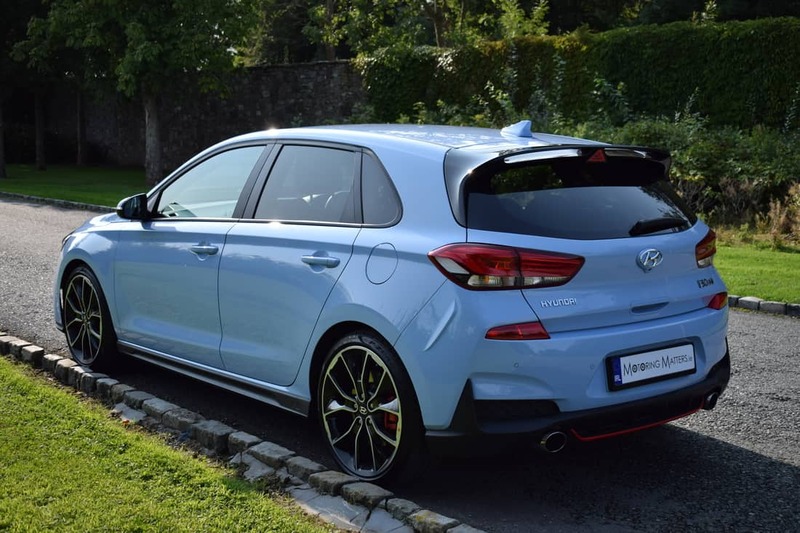 The new Hyundai i30N is very competitively priced from just €39,995 (ex-works) and is a very well-rounded and accomplished hot hatch in every way. A Co2 emission figure of 163g/km translates to annual road tax of €570.